When we were walking around Lennox on Monday, we passed an amazing Catholic Church (St. Ann) just a block from the inn. I persuaded everyone to get up early for the 7:00 am Mass. Much to Sharon's chagrin, the Mass turned out to be in the hall next to the church rather than in the church. We did find a side door open so we were at least able to walk through the church after Mass. Afterwards, Sharon, Tom and I had breakfast at the Birchwood Inn. It was a great spinach soufflé. After breakfast, we made a quick stop at The Mount. This is Edith's Wharton's home. After some discussion, we decided not to wait until it opened and headed down the road. 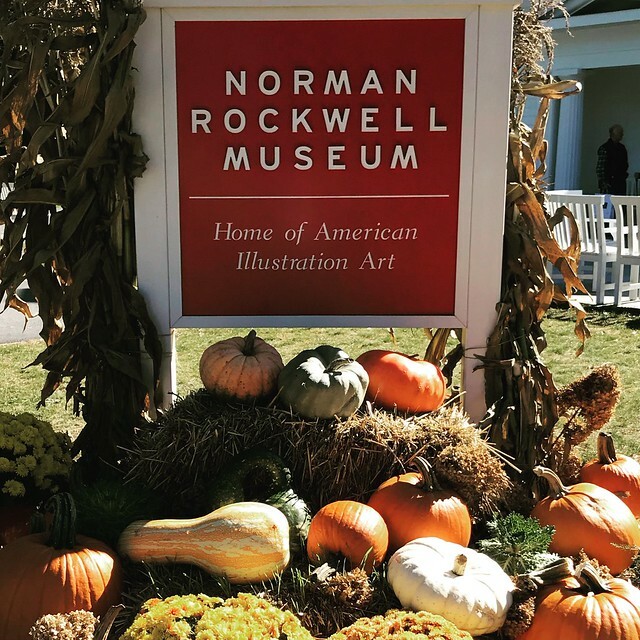 The goal for the morning was the Norman Rockwell Museum in Stockbridge. The museum exceeded my expectations. Rockwell's output was amazing. It includes an astonishing array of Saturday Evening Post covers, print advertisements, media promotional material (Stagecoach!) and portraits. I was particularly impressed with the portraits of Eisenhower, Nixon and Kennedy. They had a special exhibit contrasting Rockwell's works with Andy Warhol. Given that Rockwell is viewed more as an illustrator than an artist, his works are not displayed at other museums. This is really the first chance that I have had to look at his art. At this point, we parted ways with Tom. Both Sharon and I had thought that we were going to spend more time with Tom, but he seemed to be marching to a different drummer. I have lamented in the past that we didn't have a guide book. This time we had Lonely Plant's New England's Best Trips. After parting ways with Tommy, we followed the Berkshire Back Roads trip. We stopped in Stockbridge and walked around the town. From there we headed to Great Barrington. We parked and walked through the downtown. Based on a recommendation from the tour book, we did the river walk. We continued winding our way through Monterey, Tryingham and Lee. We eventually stopped at Cranwell for a snack. Sharon had been talking about nachos for an hour. Amazingly, they had nachos! Sharon had talked off and on about spending a couple of summer weeks in the Berkshires some day. Based on our driving tour, I was not impressed. After a nap, we finished the night with dinner at the Wheatley Hotel. This will probably be our most upscale meal of the trip. We had the four course meal. I had Swordfish as the entree, while Sharon had Arctic Char.